The Hawai‘i Tourism Authority and Native Hawaiian Hospitality Association have partnered with organizations including Kamehameha Schools to present Ka Huina – an “intersection” of tradition and innovation – on Thursday at the Hawai‘i Convention Center. Blending tradition with innovation will be the focus of discussion from the perspectives of community, culture, tourism and sustainability as part of Ka Huina – an “intersection” or “nexus” – on Thursday at the Hawai‘i Convention Center. The Hawai‘i Tourism Authority and Native Hawaiian Hospitality Association have partnered with organizations like Kamehameha Schools to feature and examine new ideas that can be further developed through discussion and collaboration. 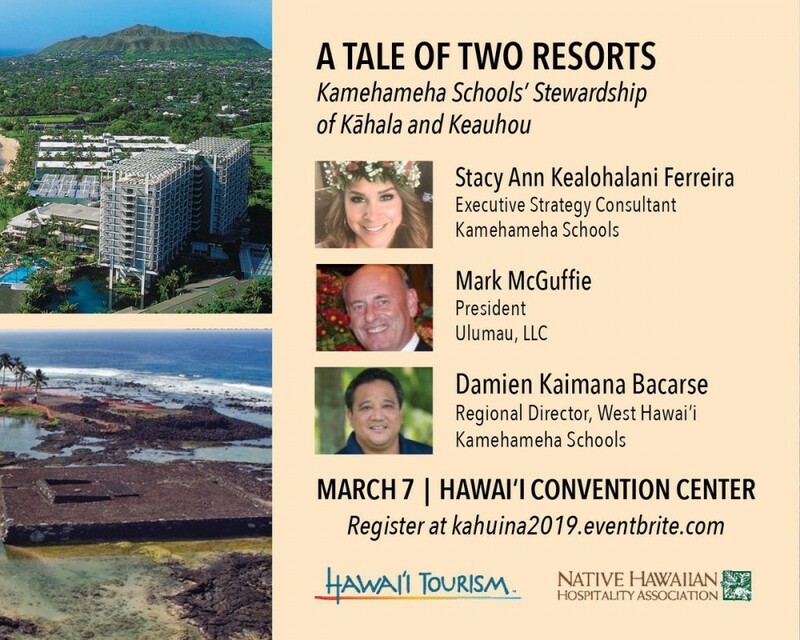 In one of the sessions, “A Tale of Two Resorts,” KS Executive Strategy Consultant Stacy Ferreira and West Hawai‘i Regional Director Kaimana Barcarse will outline the organization’s approach to both land stewardship and responsible development in two very different communities: Kāhala and Keauhou. Barcarse explains that he will share a brief history around KS’ decision to responsibly deconstruct the Keauhou Beach Hotel and re-dedicate the ‘āina to building a significant educational and cultural site to act as a piko, or hub, around which the local community can converge and engage. He will also detail KS’ improvements at Keauhou Bay and Keauhou Shopping Center, as well as the connections to field systems in Kahalu‘u and Keauhou Mauka. “This is our way of improving the ecosystem in this rich area to allow our keiki, ‘ohana and the community to thrive,” Barcarse said. The event runs from 9 a.m.-4:30 p.m. with a pau hana networking session to follow. A “Hana Lima Avenue” marketplace will also be available at the gathering where local artisans and entrepreneurs will showcase materials and new methods of expressing traditional knowledge and culture. To register, and for more information, visit www.kahuina2019.eventbrite.com, or call 628-6374.